I wrote this analytical report for an assignment I had in 'PACS 605: Conflict Transformation and Peacebuilding' for Professor Nathan Funk Ph.D, at Conrad Grebel University College, University of Waterloo during the Winter 2015 term. The outline for this assignment was a 7-9 page retrospective assessment of a yet unresolved conflict, analyzed in the context of class themes. My analysis is not meant to be exhaustive, but is the first of three parts on the topic of The Islamic State for research assignments I have this term: 1) An Analysis of Promoting Peace in a Realist Conflict: Non-Violent Attempts to Destroy & Degrade The Islamic State (IS) - [A retrospective assessment of an unresolved conflict for PACS 605: Conflict Transformation and Peacebuilding], 2) Investigating The Islamic State's Unprecedented Recruitment Efforts via Electronic and Social Media(s) - [Analyzing an emerging issue in the field of security studies for PACS 635 - Security Ontology: Issues And Institutions], 3) Formulating a peace-building strategy for conflict resolution in the retrospective assessment case study for PACS 605. The use of soft power to destroy and degrade The Islamic State (IS/ISIS/ISIL) has failed to attain any measurable result. While the path to conflict cessation in Iraq and Syria might require the use of military force, the road to recovery and a lasting peace in the region ultimately demands the use of soft power and non-violent peacebuilding. Please let me know what you think. All feedback is greatly appreciated. Amidst the collapse of the Syrian regime of Bashar al-Assad, a militant extremist jihadist group has emerged, seizing control of a large territory encompassing parts of Syria and Iraq. The group in question is known to the majority of the world as ISIL/ISIS - or Islamic State of Iraq and the Levant or Islamic State of Iraq and Syria. Since their swift chain of military victories in 2013 and 2014, ISIL/ISIS has shortened their name to just the ‘Islamic State’ (IS). The brutal tactics of this Islamic extremist group embodies the Machiavellian principle that “it is much safer to be feared than loved, if one has to lack one of the two.” The civilian death toll at the hands of IS has grown at an unprecedented rate, effectively “killing faster than statisticians can count.” In 2014 alone IS was responsible for an estimated 21,000 to 47,000 deaths, civilian and combatant, continuing a trend of doubling year over year since 2012. Although the military advance of IS across the Levant region have been nearly unimpeded, efforts have been launched to resolve the regional conflict outside the context of a military intervention. The UN has attempted to bring about conflict cessation through conflict mediators, regional forces such as Turkey, Saudi Arabia, and Jordan have used a mix of military and non-lethal support, and grassroots efforts have been deployed on a local level. This retrospective analysis of peace-promotion efforts will evaluate the attempts to bring about conflict cessation, without the use of overt hard power, in the context of IS aggression in the regions of Syria and Iraq. However, the historically inhospitable environments of Syria and Iraq, have and will, remain a substantial hindrance to cultural liberalization and the cessation of conflict. Known as the Syrian Uprising, the current conflict in Syria began in the spring of 2011 between pro-democracy protesters and the Syrian regime in the context of the Arab Spring. The power vacuum left by U.S. forces and coalition troops after the withdrawal in neighbouring Iraq, in December 2011, enabled the influence of IS to proliferate in the ensuing chaos. After the heavy military offensive IS launched in the summer of 2014, estimates suggest that the IS controlled territory in Iraq and Syria are roughly “equivalent to the size of neighbouring Jordan.” IS has encountered hard power military resistance from three primary sources: Syrian Security Forces, the Iraqi Military, and the Kurdish Peshmerga. The Syrian Security Forces are engaged in a large-scale conflict nation wide and have not devoted full attention of force towards IS, leading to their capture of oil fields and large cities – such as the IS capital of al-Raqqa. The U.S.-backed and trained Iraqi military has largely crumbled under the advance of IS fighters, resulting in the capture of Mosul, an Iraqi city with the population of over 1 million residents. On 21 April 2012, the United Nations adopted UN Security Council Resolution 2043. UNSC Resolution 2043 was not directed towards IS, but rather at the Syrian conflict as a whole, “reaffirming [the UN’s] support to the Joint Special Envoy for the United Nations and the League of Arab States.” However, citing an “increasing militarization on the ground and the clear lack of unity in the Security Council,” Annan relinquished his role amidst the continuance of open hostilities between Syrian Security Forces and the rebel groups. Following the departure of Kofi Annan, Lakhdar Brahimi assumed the role as Joint Special Representative, but still encountered the fatal roadblocks experienced by Annan. Matching the instability of the Syrian environment, Brahimi likewise relinquished his position in the summer of 2014, resulting in the appointment of the current Joint Special Representative, Staffan de Mistura, in July of 2014. The three Joint Special Representatives have been largely unsuccessful at implementing conflict cessation in Syria, with Syrian Security Forces and IS both ignoring any attempts for diplomatic peace-building efforts. Descending a step in the scale of approach, outside the context of the UN an anti-IS coalition was formed by upwards of 62 nations: 21 of the 62 nations have provided lethal military assistance, while 13 of the 62 nations have provided, exclusively, humanitarian support totaling over $100 (USD) in the form of medical supplies, blankets, and foodstuffs. The conflict in the IS-controlled regions of Iraq and Syria has prevented an effective deployment of aid workers, whether foreign or domestic. In the cases where journalists and western aid workers did operate in Iraq and/or Syria, they were kidnapped, held as hostages for ransom, and ultimately executed. IS is indiscriminate in their targeting, repeating this macabre process regardless of nationality, religious affiliation, or gender. While IS continues to repel outside intervention, in some instances, they have provided aid and public works to the denizens of their controlled territory, especially in areas hit hard by the Syrian regime. Nonviolent peacebuilding efforts implicitly rely on good faith measures from all parties involved. Prior to IS seizing control, the Syrian regime was the sole coercive force in the Syrian regions. Syrian Security Forces have similarly acted with impunity, dwarfing the IS death toll with an estimated 200,000 dead, for all of Syria, as of December 2014. The failure of the UN Joint Special Representatives was a direct result of the Syrian regime’s unwillingness to reduce their military mobilization. In the Iraqi and Syrian territories now controlled by IS, IS forces are, at this moment, the sole coercive force directly present in a local capacity. As such, IS has one of the key principles behind the concept of state sovereignty. The continued trend for the failure of conflict cessation exists due to IS’s continuance of using brutal and violent tactics as a default response to all levels of opposition, whether local, Muslim, or otherwise. Even in the Iraqi and Syrian diaspora when the unification of displaced refugees has taken place, host nations have viewed the peaceful grassroots mobilization as a security issue. Compounding the struggle to regional peacebuilding is the immense regional strain that exists from the continued accommodation of Palestinian refugees. Regardless of the theological legitimacy of IS’s claims to Islamic principles, they themselves are determined to endeavour by any and all means to both hold and increase their influence across the Levant. In the discourse that is regional conflict in the Middle East, the language IS has chosen is unrestrained violence. The attempts to counter IS influence in the region, whether that is by completely eradicating IS or just alleviating the suffering of those under IS control, have been met by fierce and immediate IS opposition. In this Realist, ‘might makes right’ landscape constructed by IS, peacebuilding tactics are not able to take hold, let alone flourish. Denizens of IS controlled regions have largely resulted to capitulation as a method of self-preservation when engaging with IS. Empowerment of local populations appears to be unattainable when just the act of survival is a daily struggle. The result of is an emboldened IS that does not envision an impending defeat, making the thought of negotiation highly improbable. The use of soft power to combat the influence and advance of IS in Syria and Iraq has been met with increased barbarity and continued bloodshed. Relief efforts and non-lethal assistance have been delivered to the denizens of IS controlled territories in Syria and Iraq. However, the use of diplomacy, nonviolent peacebuilding, and humanitarian aid is a currency which IS refuses to trade in. The history of the violent totalitarian regimes have fostered the brutal environment in which IS now prospers. While popular uprisings, diplomatic measures, and cultural appeals perhaps worked, at least in part, with the previous regimes in attempts to liberalize or build peace, IS repeatedly greets these approaches with unrestrained violence – from summary executions to beheadings. The case study of IS represents the extreme end of a violent spectrum, resulting in the failure of soft power to bring about conflict cessation or even degrade IS control. The use of non-violent peace-building and soft power methods certainly has limits in this application, but they must not be forgotten. While conflict cessation or the reduction of IS control cannot be achieved by soft power or nonviolent methods of peacebuilding, the key to a lasting calm beyond the reign of IS certainly lies in these approaches. The absence of long-term conflict resolution approaches in Iraq, which bolstered the region’s instability after the American withdrawal in December 2011, is what created the environment in which IS proliferated. To make sure the continued pattern of short-sighted realism does not embark upon a successive cycle after the eventual defeat of IS, the methods previously forsaken must be applied. 19. Referring to the cases of non-combatants: aid workers David Haines (British), Alan Henning (British), Peter Kassig (American) and Kayla Mueller (American), journalists James Foley (American), Steven Sotloff (American), Haruna Yukawa (Japanese), and Kenji Goto (Japanese). Back in September of 2014 I participated in an annual conference hosted by the Group of 78 and Project Ploughshares in Ottawa, Ontario, Canada. 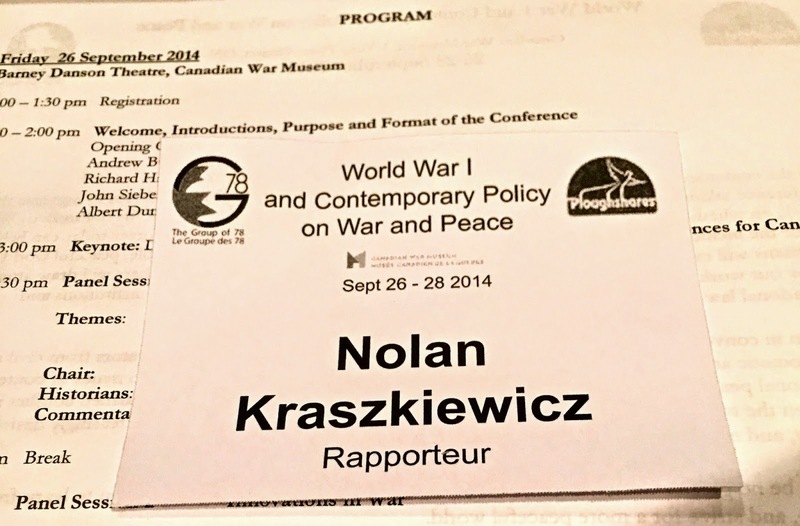 I, along with three of my colleagues from Conrad Grebel University College and the Executive Director of Project Ploughshares, John Siebert, went to Ottawa for the WWI and Contemporary Policy On War and Peace conference. I served as a rapporteur of the conference proceedings, charged with writing about two of the main conference discussions. From Left to Right: Holger Afflerbach, Tamara Scheer, Daryl Copeland, Ernie Regehr, Mustafa Aksakal, and CBC's Michael Enright. Attending this conference as a rapporteur was my first major extra-curricular outing as a graduate student. Over a decade had passed since I last visited Canada's national capital - which brings the current score of the Canada vs. U.S.A. capital visits competition to 2-0 in favour of Canada. Concluding Roundtable Summary: What can we learn from WW1 to make the 21st century a century of peace? What did we learn from WW1 to make world a safer place? The traditional 19th century opinion of ‘The Fatherland’ faced a watershed moment. The notion of “Dying for Fatherland” that was prevalent in 19th century Europe was abandoned except in its cynical or ironic uses. This was quite a political departure. WW1 served as an exercise in the failure of our ability to accommodate shifting power. The only thing we ever learn is that we never learn. It is now more necessary than ever to learn from previous conflicts to prevent emerging and escalating conflicts. The key is to understand and evolve past these issues to address the big ones that humanity faces collectively. WW1 was transformative in the Middle East and shaped how it is today. WW1 touched off civil war and mass traumas that lasted well into the 20th century. Understanding this period as the origin of contemporary problems is invaluable. Often times the region is described as having populations predisposed to violence, which is categorically untrue. What the denizens of the 34 Middle East have been subjected to for the past century is shortsighted Western policies of imperialism, colonialism, and interventionism. Organic growth in the region continues to be scarred from the consequences of WW1. Conflicts are multifaceted and are by nature hard to understand fully for factors and igniters, especially when the WW1 alliances were so veiled and secretive. Rather than apportioning specific blame, humanity should extract useful lessons. For instance in WW1 the assassination of the Archduke Ferdinand caused events that spun out of control. When politicians default on their responsibilities as decision-makers, the result is handing their control over war to the military. Regardless of the justifications used for war, all belligerents bear responsibility. Nations should unite not in military alliances, but rather in understanding that they should not be sending their sons and daughters off to war. This ideal is what has fostered peace in the European Union. The role of the media must be considered, for instance, in the case of the Hapsburg Empire from the turn of the century up until 1914. Newspapers treated war like it was expected, yet people were surprised when armed conflict actually broke out. Bertrand Russell remarked that England was also happy for war. WW1 gave us new technologies to build better weapons. Humanity has perfected the means to kill each other. What mankind has yet to do is wholly unite against non-traditional threats, whether that be climate change, diminishing biodiversity, resource shortages, or the challenge of managing the global commons. There are no military solutions to many of the threats which now imperil us all. Airstrikes are no remedy for a warming planet. Expeditionary forces cannot occupy the alternatives to a carbon economy. Garrisons and border guards are useless against the advance of pandemic disease. These sorts of issues are best addressed using the tools of diplomacy and development: dialogue, negotiation, knowledge-based problem solving and cooperative action in concert. Framing a conflict as war will always leave a winner and a loser. However, it is what those parties choose to do, either in victory or defeat, which will shape the future. While the Americans won WW II, they have been a global leader in armed interventions during the second half of the 20th century. Conversely, Germany and Japan have adopted foreign policies centered on pacifism. The frame of conflict analysis is always focused on why war happened or who was responsible. Perhaps our thinking should be the other way around: Why did the peace work before? Credit has to be given for the prevention of large-scale wars since the end of the two World Wars of the 20th century. Diplomacy has identified conditions that would lead to war. Attention must be given to de-escalation and prevention. Nations must never stop talking; transnational cooperation needs to exist in good times and bad. There exists a grotesque imbalance of resource allocations in major nations, as the lion’s share of resources fall to defence agencies and defence corporations. In the USA there are more soldiers in uniformed marching bands than there are diplomats. In any given year the budget increase alone that is afforded to U.S. defence exceeds the total budgets of the State Department and USAID combined. A major disparity between defence spending and spending on diplomacy and development of nearly 24:1 exists in the U.S., while Canada is 4:1, and the Nordics are 1:1. Contemporary wars are primarily intra-state or civil wars and they emerge out of internal conflicts based a variety of social, political, and economic grievances and the failures of 35 national institutions in weak states to mediate effectively and respond to chronic grievances. Military force is incapable of mitigating these grievances or of forcing dissident movements, once they have gained the support of major communities and sections of the populations, to conform. Political accommodation is the only sustainable response, yet most states, even or especially weak states, are better prepared for mounting military responses than political responses. The result is long drawn out civil wars, even though they cannot be, and are not settled on the battlefield. Most wars today, in fact, have little in common with the circumstances and conditions of World Wars I or II. Special attention must be afforded to the distinction between commemoration and glorification of war. Countries recently engaged in conflict or those nations that were plagued by conflict for decades regard war in a manner that contrasts with countries that have not had conflict waged on home soil in quite some time. Did they all die in vain? Soldiers that perish on the battlefield and civilians that bear the brunt of a conflict will die in vain if the lessons learned from that conflict are not applied towards the future. If the conflict does not just lead to peace, but an understanding of how to sustain peace, then the victims of war will indeed die in vain. In the case of WW1, little was learned – and that led to WW II. History does not create workable models for the future. What is clear is that war must be avoided at all costs. In the tradition of Bertha von Suttner, the first female to win the Nobel Peace Prize, she insisted that you never stop talking. Never give up. Meeting a person’s basic needs of food, water, shelter, and economic prospects contribute more to human security than any military force could. Security is not a martial art. Human security is the key. Freedom from fear and freedom from want. Canada’s capacity to contribute and innovate when it comes to assisting humanity towards peace must be resurrected. Unfortunately in Canada today much of that capacity has been lost. Canada has moved away from internationalism and diplomacy, and renowned institutions and civil society organizations are among the casualties. As a result Canada is losing its established influence on the international stage. I would like to thank the Group of 78 and Project Ploughshares for this marvellous opportunity. Additionally, I would like to thank my colleagues Allie Bly, Darren Kroph, and Sandrine Uwimana for contributing to an awesome weekend. From Left to Right: Darren Kroph, Allie Bly, Sandrine Uwimana, John Siebert, and Nolan Kraszkiewicz (me).